Nice sunny days were in store for a couple of days so I put the room remodeling project on hold to venture out to old haunts. The one haunt was Cochran’s Mill. This was a community in times past forced to abandon their homes and business. 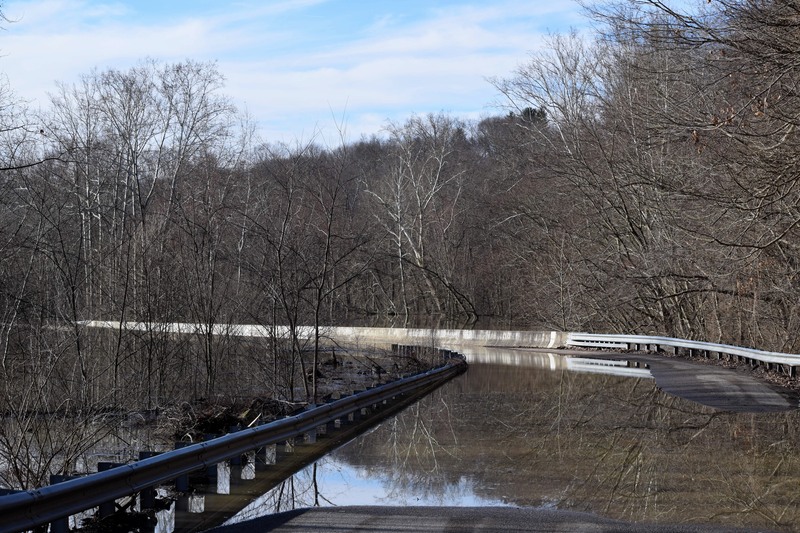 The reason the people of the past had to leave the area was due to the fact of the government building a flood control dam further downstream on the waterways known as Crooked Creek. Many stone foundation remnants are still present throughout the wooded area. 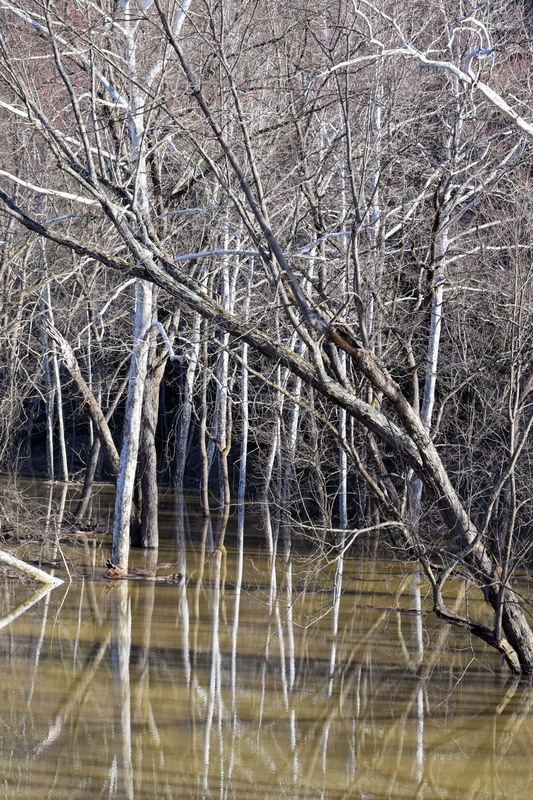 As a young fellow, my parents and sister and I were present here to see the old Cochran’s Mill bridge under water. The old bridge would flood annually as the Crooked Creek Dam would hold back water to control flooding in Pittsburgh, Pennsylvania. A new bridge was erected a short time ago and was erected higher than the old bridge. However, this new structure was flooded with all the rain we have had in recent times. I wanted to visit this area this day. There are two bridges here. One was built new and another repaired in recent years. As part of this day’s jaunt I elected to walk some of the Baker Trail which runs through the Cochran’s Mill area. 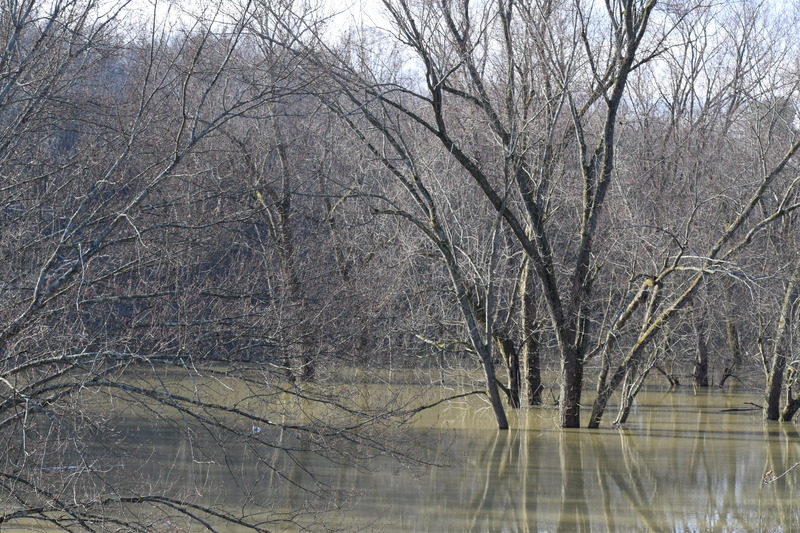 One can walk along a steep and high hillside and view the flooding. 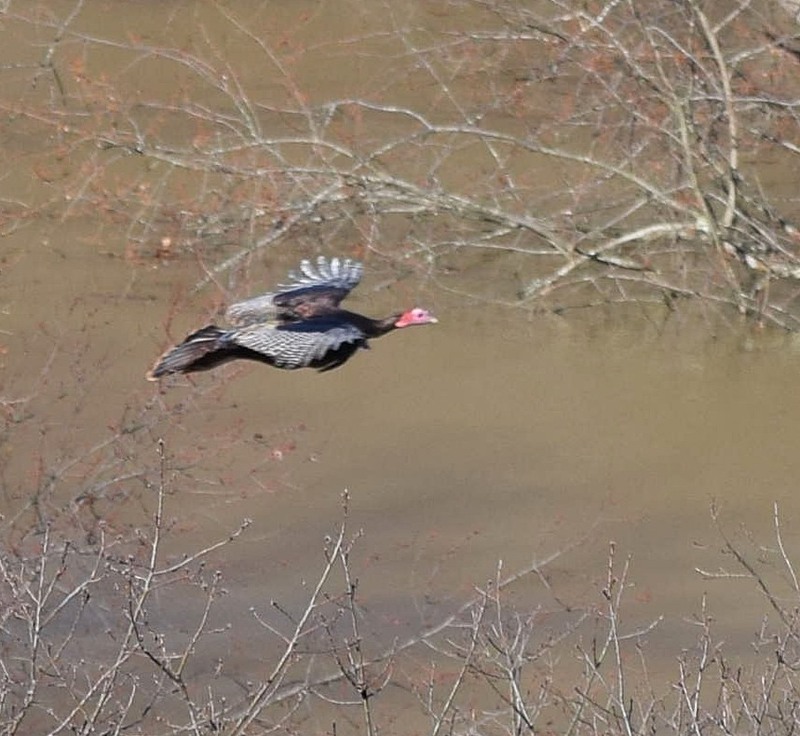 Here I was fortunate to see a flock of turkeys flying over the watershed. The flock consisted of around twenty birds. The common ties I have with this area are many. My mother Ruth Yount was raised about a mile or so south of this bridge near a place called locally, Rearick’s Ford. My father, Allen Smail was raised at the present-day Cherry Run intersection. 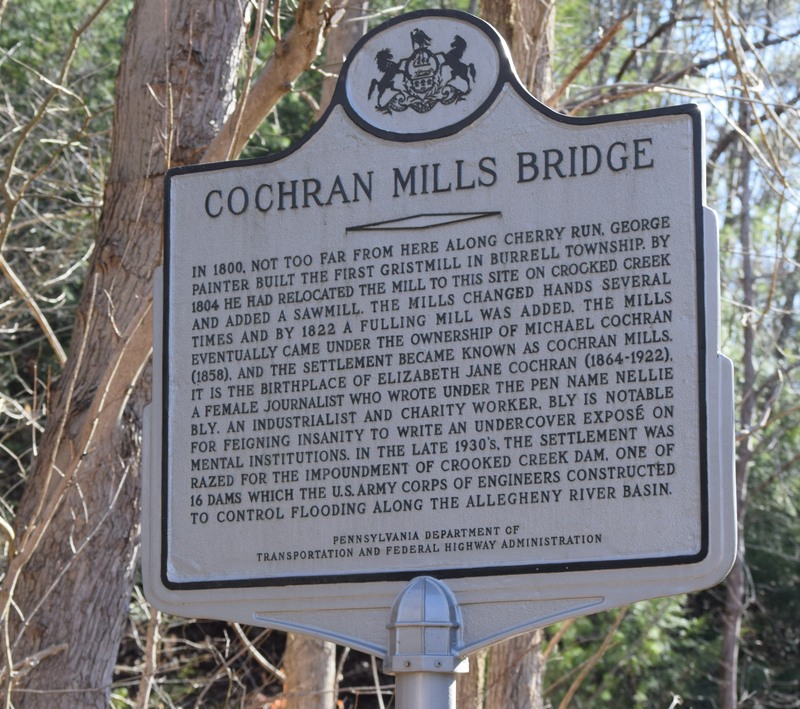 The Cherry Run Gorge flows between his home and joins Crooked Creek here at Cochran’s Mill. Many relatives lived along this Cherry Run watershed and Crooked Creek. I have fished in these waters many times. My dad and I would gather crayfish here to go and fish for bass. I can honestly state I have been in every hollow and on every hill from my dad’s homestead to Cochran’s Mill. Today much of this area is posted. Back in the day a famous writer named Elizabeth Cochran came from this long-gone community. 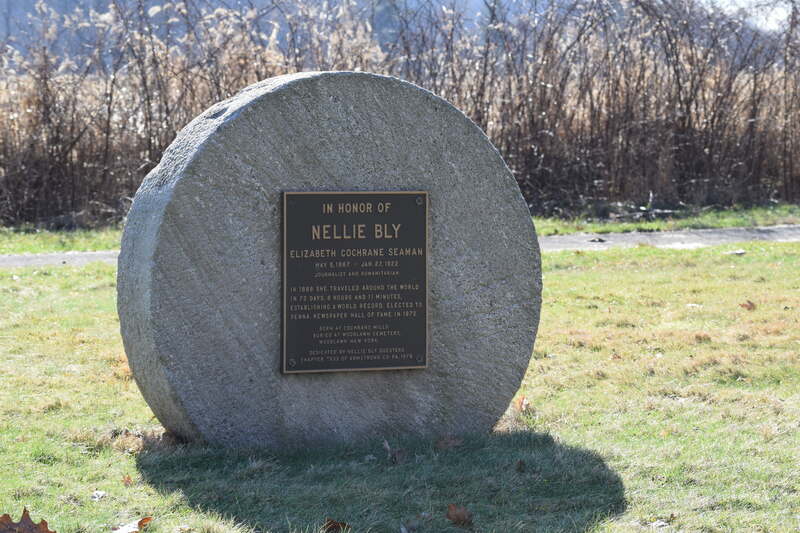 Her per name was Nellie Bly. 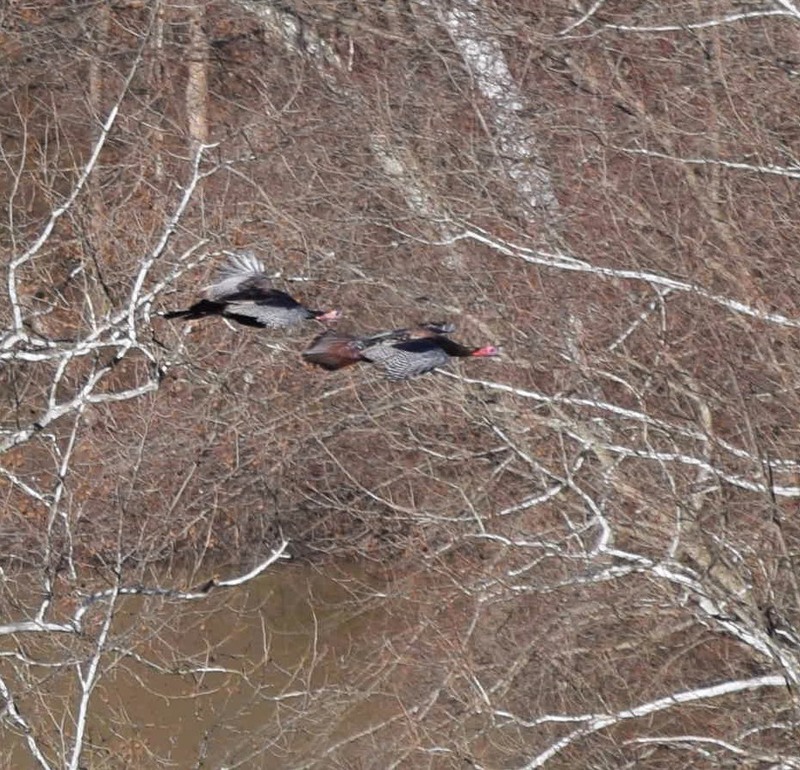 I watched two Woodies fly over the waters and heard some Canada geese as well. Later, I ventured down stream some to visit a site named Robb’s Fording. A Beautiful Evening Walk… Calm, Peaceful and Beautiful! I am behind my times. 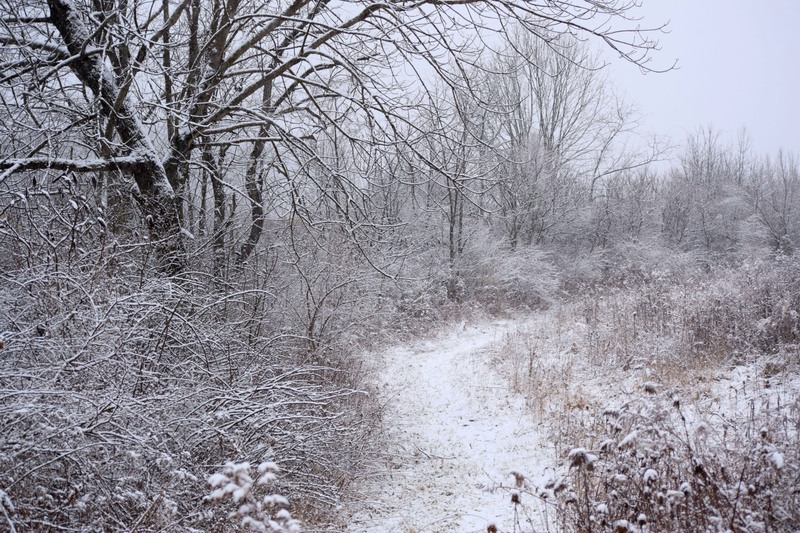 Yes, the walk I am writing about occurred a week ago during a beautiful snowy day. I have been remodeling a room and have neglected to add this entry. The interesting truth of the matter is of this past week with record breaking heat and rain. The temperatures actually reached into the upper seventies. I find this hard to imagine since a week ago I was in a snowy heaven. As stated, I had been working with remodeling a room. 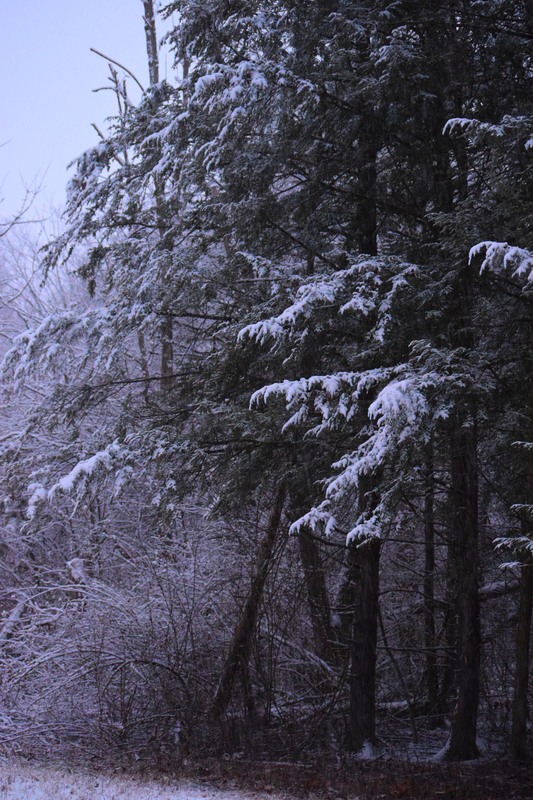 However, the snow-laden landscape was nudging at me and I elected to head out for an evening hike. I knew the planned walk would bring me full circle after daylight had ceased for the day. Yes, this was to be a grand time afield for me. I hadn’t gone far when I found four sets of deer tracks. they were obviously not very old since the falling snow would have erased the detail I was seeing. I worked a ridgeline peering down over to try to see deer. As I approached a basin-like hollow I noticed the four deer exiting across form me. They went up and over the hill side. 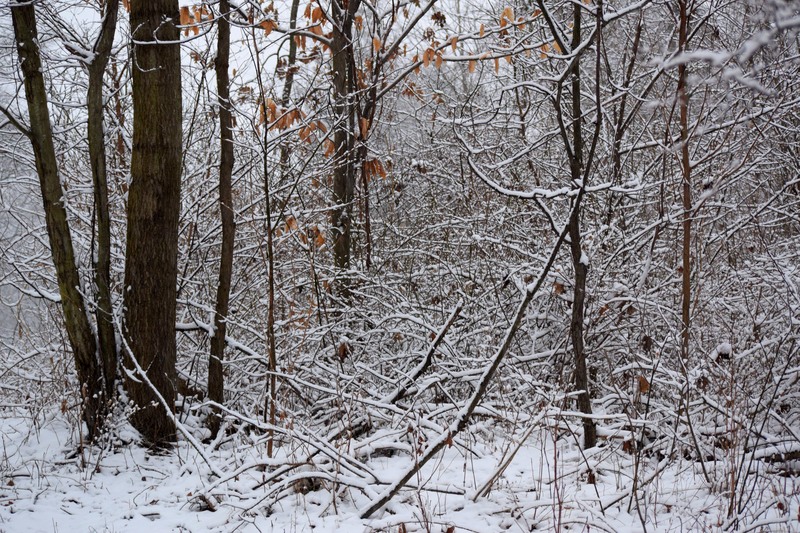 I walked a short distance and found more tracks crossing before me. I would see three deer at this point. The hike was so peaceful. 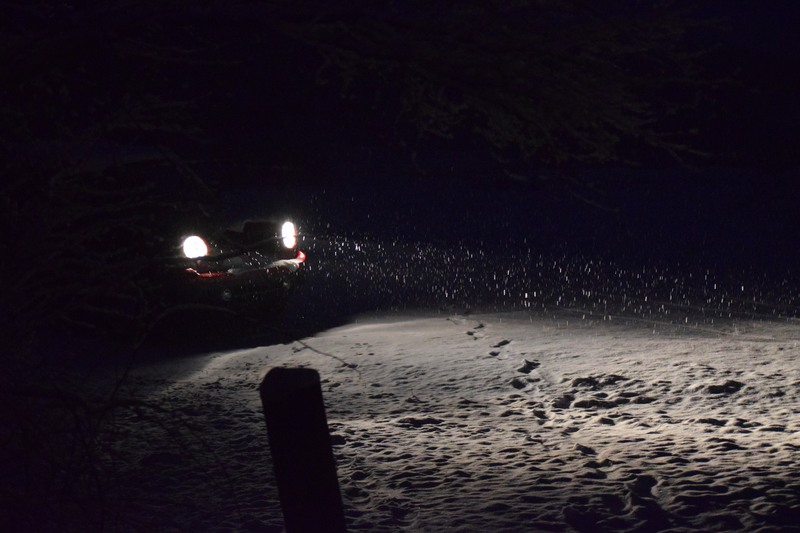 The air was still as possible and the snow falling was straight from heaven. 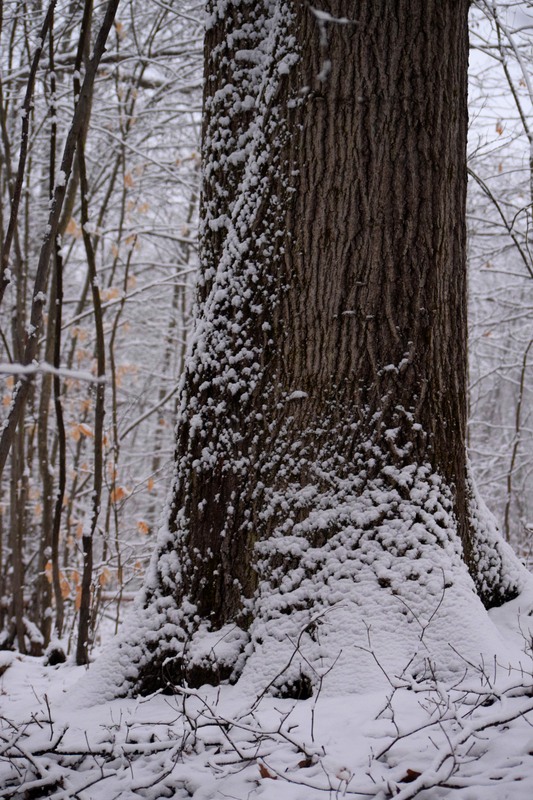 The trees and limbs were all holding an inch or so of snow. 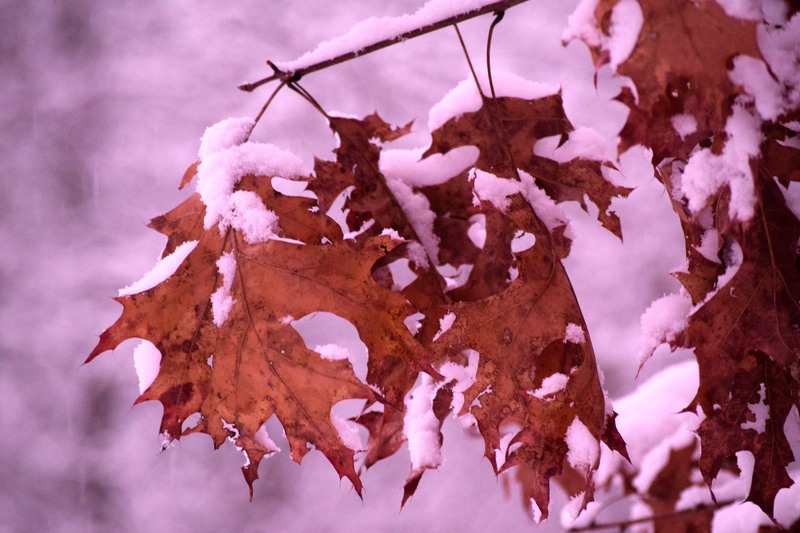 As dusk approached a beautiful pinkish hue covered all things. I was in awe at how the dusk was surrounding me. I stopped to listen and watch and take it all in. Darkness was becoming dense and I would not be able to take any more photos while hand-holding the camera. I jumped several deer and would see five altogether in thick goldenrods. I barely could make them out at this time. I reached the jeep well into darkness.truthfully, I hated to end the jaunt, but I had witnessed a grandeur seldom sensed by mankind today. Peace on earth!